This week, we observed the seventh anniversary of the Sept. 11 attacks, a terrible legacy of the terrorism and hatred in our world today that caused so much pain. We pray these deep divisions in humanity will be healed and people will be able to live in harmony and peace. We hope they can overcome the resentment and violence, which will lead them to God’s love. On Saturday, Sept. 27, five teams of volunteers and employees of Catholic Charities will be cycling in the Rodman Ride for Kids. For 17 years now, the Ride has been one of the largest matching gift charity events benefiting at-risk youth programs in Massachusetts. The Ride has raised more than $31 million for non-profit programs to date. I am pleased that for the fourth year, Catholic Charities is a benefiting agency of The Ride. The Presenting Sponsor of The Ride is Liberty Mutual, whose CEO Ted Kelly received Catholic Charities’ Justice and Compassion award this past May. All of the money raised for Charities will fund the Teen Center at St. Peters in Dorchester, the Search Out Another Road (SOAR) program in Brockton, Sunset Point camp in Hull, the Laboure Center in South Boston, the Santé Manman Sé Santé Petit pregnancy-counseling Program at the Haitian Multi-Service Center in Dorchester, the Parent Aide program in Lynn, as well as the Education and Parenting Skills Center in Lynn. These eight programs are crucial to Catholic Charities’ mission to promote healthy lifestyle choices for our young and vulnerable. Catholic Charities must raise $75,000 this year. Father Hehir and Father Erikson generously lent their support to Charities by sending a letter to parishes within the Archdiocese asking that information about The Ride, including posters and donor cards, be available to parishioners throughout September. Keep an eye out in your own parish for these materials. 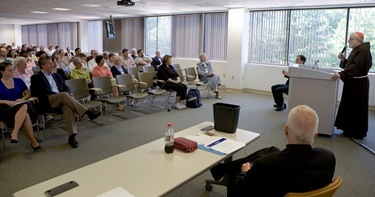 At the Pastoral Center, we are initiating meetings with the general staff on First Fridays after Mass and lunch. 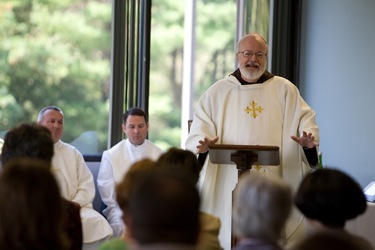 The new Pastoral Center in Braintree was made available to us by the generosity of the late Tom Flatley. 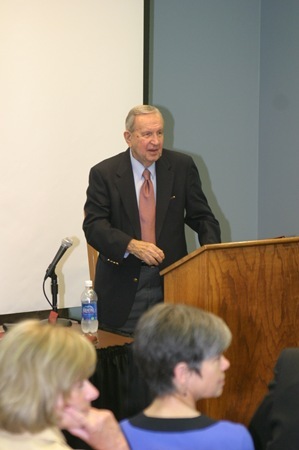 In the near future, we will dedicate a memorial plaque to Tom in the lobby of the center as a reminder of how this man from humble beginnings was able to do so much good in his life. The meeting was held in our beautiful conference room, which holds about 200 people. It was a chance to share with everyone the current policies. It is also an opportunity for the various offices to acquaint each other with their various ministries. At the meetings, different offices will make presentations about themselves, like the one Sister Marian Batho gave us on her role as the Delegate to the Religious Community and on the Archdiocesan Pastoral Council. 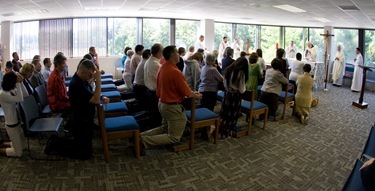 Before we moved into the Pastoral Center, so many of the offices were at different locales; it is a blessing for us to suddenly be together. We want people to feel a part of the mission to the Church and to feel a sense of unity and purpose in what we are doing. Father Richard Erickson, our Vicar General, came up with this idea, and everyone seems enthused about it. At the meeting, we were very pleased to announce to the employees — and now to you here — that on Oct. 1, we will open the Pastoral Center Chapel. 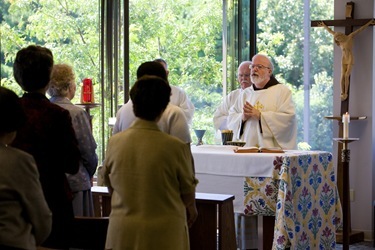 The chapel will be an important part of our Pastoral Center, not only for celebrating Mass, but also for private devotions. I made a personal invitation to our employees of other faiths to consider themselves welcome in the chapel to practice their own prayers. At the end of the meeting, Victor Rios, who has been working for the archdiocese for more than 28 years, drew the names out of the hat for three sets of tickets to the Boston College-Georgia Tech football game. The Eagles lost 19-16, but next Saturday the Eagles play the University of Central Florida Knights. We are rooting for the team to get back on track. Go Eagles! 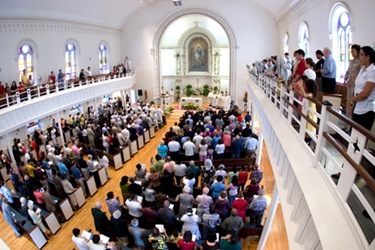 Last Sunday we traveled up to Immaculate Conception in Salem for the church’s 150th Anniversary Mass. 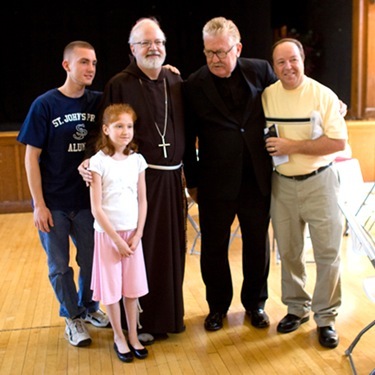 Father Tim Murphy, the pastor, has done an extraordinary job there. The church is very beautiful. Inside there is a gorgeous painting of Mary as the Immaculate Conception over the high altar. Outside on the lawn, there is a monument of the Ten Commandants made of marble from Mount Sinai, which I blessed at its dedication in 2006 — the last time I visited the parish. 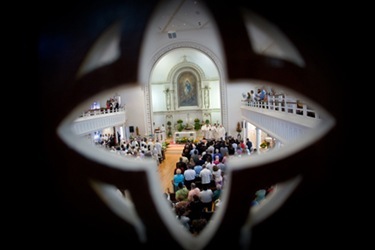 Immaculate Conception is one of the few churches we have with a gallery looking down on the rest of the congregation. 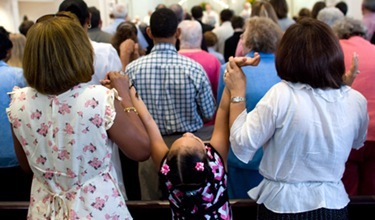 It is a common feature of New England churches, but rarely seen in other parts of the country. The old practice among New England Protestants was to raise money to build and maintain a church by selling and/ or renting specific pews or family boxes. The galleries were to allow for free worship for those who did not own or rent a space on the ground floor. Over time, the practice of designating pews stopped, but the style continued. The church was filled for the celebration and they had two wonderful choirs. The Knights of Columbus and the Order of Malta both figured prominently in the celebration. The parish now has a large Hispanic community and a priest from Columbia, Father Carlos Gomez. The greeting and history of the parish was given by a parishioner, Phil Moran, who is a member of the Knights of Malta and a representative on the Archdiocesan Pastoral Council. Phil is also the president of the Pro-Life Defense Fund. One of the nice things they did for the anniversary was to organize a parish pilgrimage to Lourdes, which is also celebrating its 150th anniversary. 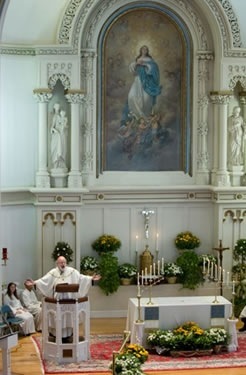 The church took its name just at the time when the Church was formalizing the definition of the dogma of the Immaculate Conception of Mary, even though the doctrine goes back to the earliest days of the Church. It was during the Blessed Mother’s apparitions at Lourdes when she identified herself as the Immaculate Conception, which explains why that title was chosen at that particular time in history. 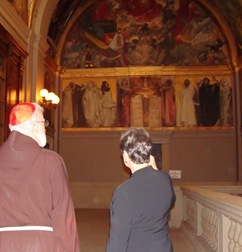 While Father Murphy was in France, he visited the Cathedral of St. Andre in Bordeaux, where the first bishop of Boston, Bishop Jean-Louis Cheverus, is buried. 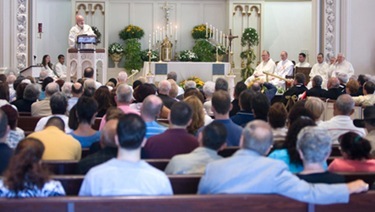 To see more photos of the Anniversary Mass click here. 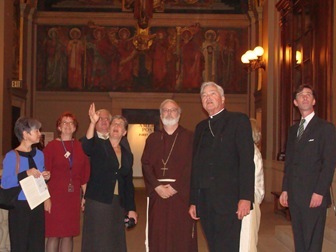 Sunday night we went to Washington for a meeting of the U.S. Conference of Catholic Bishops’ Committee on Clergy, Consecrated Life and Vocations, which I chair. 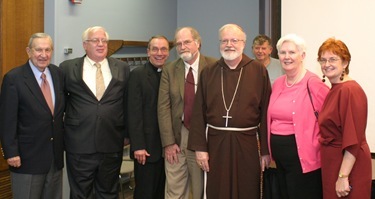 Father Jim Steffes and Father David Toups helped me prepare Sunday for the meeting which was all day on Monday. One of the many topics we discussed at the meeting was a report given on the Vocations Desk the committee sponsored to provide a presence at World Youth Day in Sydney. 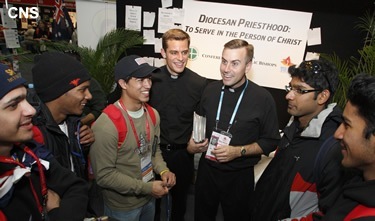 Thousands of young people visited with the staff of the Vocations Desk, and they even had bishops volunteer to meet with young people discerning. One of the interesting statistics they presented at the meeting was that one-third of seminarians said participating in World Youth Day was a very significant factor in their decision to enter the seminary. 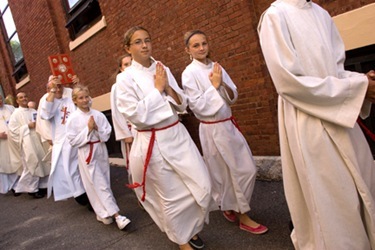 It only underscores the importance of this ecclesiastical event that was the brainchild of Pope John Paul II. Tuesday and Wednesday we held the administration board meetings to discuss and develop the agenda for our November meeting. We also took care of some business of the bishops conference that has to take place between our formal meetings. Cardinal George, the Archbishop of Chicago, is the president of the conference. One important piece of business was the issuing of a statement from the bishops on the misinformation put out by some Catholic politicians on Church teaching. The bishops are concerned about politicians pontificating on theological questions about which they know very little. 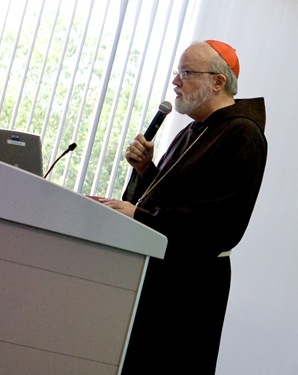 One of the challenges facing us as Catholics is how we communicate — to our own people and to the larger community — that the question of abortion and the immorality of abortion is not simply a matter of the Church trying to impose Church doctrine on other people in a pluralistic society. Rather, it is our firm conviction that abortion, like murder or racism, is a crime against humanity and a violation of the Natural Law that flows from who we are as human beings and that can be identified through reason. That is why the Church feels very comfortable advocating for the Gospel of Life. We are not insisting that they embrace the Catholic faith, but we are insisting that they defend human rights. Life is the basic human right. That is why it is so disturbing when politicians and others try to dismiss us as people with merely an ecclesiastical or religious sectarian point of view or opinion. It is not that way at all. We also need to impress on people that this is not some recent opinion. These teachings against abortion date back to the earliest days of the Church and some of the oldest writings of the Fathers of the Church. Right from the beginning, the Fathers of the Church were very, very clear as to the seriousness of this crime. Cardinal Justin Rigali, chairman of the U.S. Bishops’ Committee on Pro-Life Activities, and Bishop William Lori, chairman of the U.S. Bishops Committee on Doctrine, issued a statement clarifying Vice-presidential nominee Senator Joseph Biden’s comments on Meet the Press last Sunday. 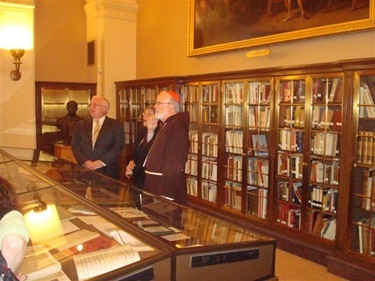 Father Bob Connors, Robert Johnson-Lally, MaryAnn McLaughlin, and other members of the Bicentennial Committee, in conjunction with officials at the Boston Public Library, put together an exhibition on the history of the Archdiocese at the Cheverus Room of the old building at Copley Square that I visited Wednesday. 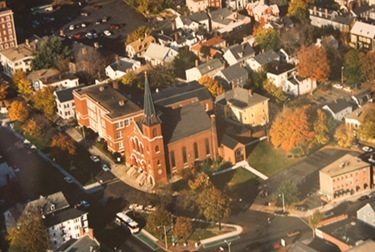 The exhibit, open until Sept. 30, was full of amazing artifacts and old photographs of churches, postcards with scenes from Catholic life and documents going back to the days of Bishop Cheverus. For me, one of the highlights was the section of photographs titled, “Nuns Having Fun.” There were antique vestments and chalices. There were dairies from the bishops. There were even old copies of The Pilot. 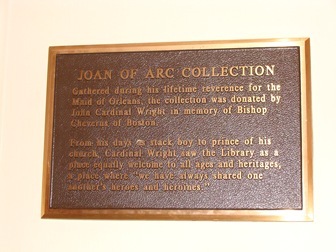 Also in the Cheverus Room at the library there is one of the the world’s largest collections of books on St. Joan of Arc that was donated by Cardinal John Wright. 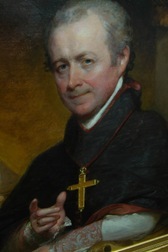 Cardinal Wright grew up in Dorchester and was the Bishop of Worcester before moving on to become the Bishop of Pittsburgh and then one of the highest ranking cardinals in Rome. He was an expert on Joan of Arc. 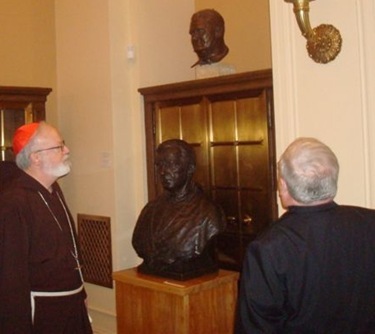 The room has two busts, the cardinal along with Archbishop Williams, and a Gilbert Stuart portrait of Bishop Cheverus. 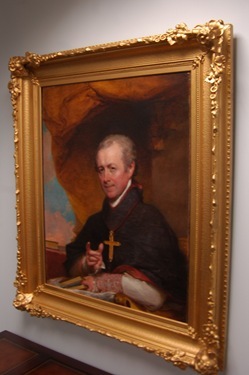 The painting of Bishop Cheverus is the same one that hangs in my conference room, both are copies. The original hangs in the Museum of Fine Arts. 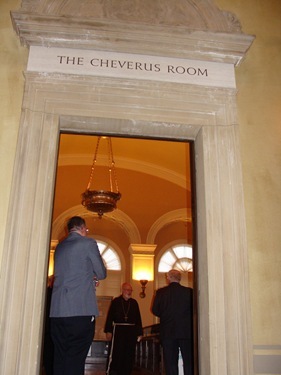 Outside in the entrance hallway to the Cheverus Room are large paintings by John Singer Sargent depicting scenes from the Old and New Testament. I was taken by the power of these paintings, which are part of the library’s permanent collection. 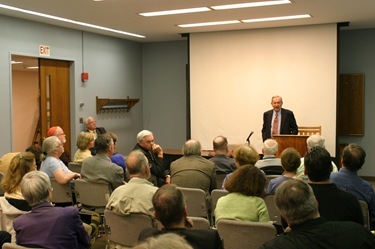 After we toured the exhibit, we attended a lecture and discussion with Boston College Professor Thomas O’Connor, titled, “Pastoral Profiles: Bishops of Boston” held in one of the downstairs rooms in the library’s new building. 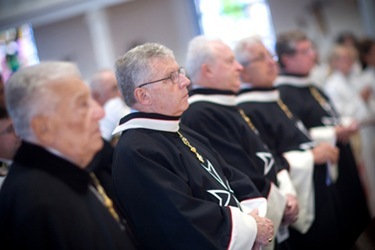 It is remarkable that in 200 years, there have only been nine residential bishops in the diocese. I was grateful his discussion of my tenure was very brief! 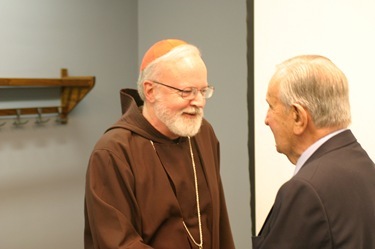 I was grateful to see so many lay people and clergy there, including Bishop John Dooher, who is very well versed in the history of the Boston Church, and Father Bill Schmidt, the pastor of St. Patrick’s in Stoneham. 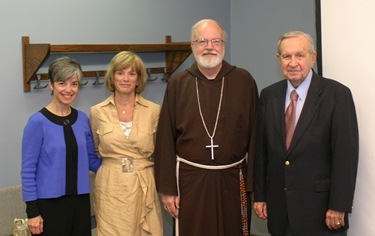 Father Schmidt wrote a chapter on the history of parish life for Prof. O’Connor’s new book on the history of the archdiocese. 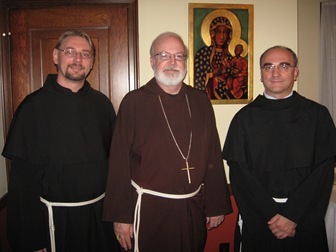 Last week I was visited by Father Mirek Bartos, OFM, Conv., Provincial of the Polish Province, and the new pastor Our Lady of Czestochwa Parish in South Boston, Father Andrew Urbaniak, who is replacing Father Jarzy Auguscik.